In recent years, due to the inclusion of popular dance in compulsory education, and the popularity of dance idols, there is a growing interest in dance. However, dance is often carried out in accordance with the music and video, rather than the sound and video responding to the dance. Therefore, we proposed a device for directing multimedia. For the purpose of this study, we focused on the dance genre known as “Lock”, which features prominent hand motions when compared to other styles of dance. 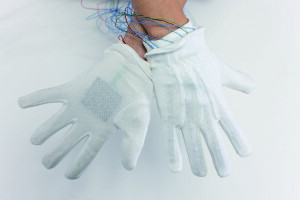 When worn by the performer, this device – through various sensors – recognizes the speed and force of the performer’s movements, which affects the music and video accordingly.